What is the Alliance of Confessing Evangelicals? How can I become a member of the Alliance? How can I support the Alliance? Stock Transfers: Gifts of stock are a great way of supporting the work of the Alliance and can reduce your tax obligations. Reformed Resources: A great way to support the Alliance is through purchasing Alliance resources. Visit our online store to buy audio, books, and more. Amazon Smile: Purchases with Amazon.com can generate donations for charitable organizations. I live in Canada, do you have a Canadian address? Or you may donate online via CanadaHelps.org. Who are Mighty Cause and the Lancaster County Community Foundation? Thank you for your gracious giving to the Alliance. The Alliance works with Mighty Cause (formerly Razoo), a third party online donation service, as well as the Lancaster County Community Foundation (LCCF) for the Extraordinary Give. Both of these third party giving tools simply relay gifts to the Alliance as they are actual charitable organizations and they themselves provide receipts via email at the time of donation. Those emails are considered an acceptable form of receipting by the IRS. It is possible, however, to request an additional receipt when needed. Is Mightycause Charitable the same as Razoo? Yes. In April 2018 Razoo was rebranded as Mightycause Corporation. Your complete giving history can now be found at Mightcause.com. If you previously set up login information at Razoo.com it has remained the same. How can I cancel or update a recurring donation on Mightycause? A step-by-step guide to managing your recurring donations on Mightycause can be found here. How do I get a receipt from a third party donation site? For gifts made through Mighty Cause, visit this page for information on how to view your giving statement. If you do not have a Mighty Cause account, contact Support@MightyCause.com. What are the Alliance's Hours of Operation? The Alliance is open Monday through Friday from 9:00 am to 4:00 pm ET. The Alliance is closed 10 days per year around holidays, including New Year's Day, Good Friday, Memorial Day, Fourth of July, Labor Day, Thanksgiving, and Christmas. Can I pay with a check instead of a credit card? Please include the shipping amount in your check total. Shipping prices can be found here. What are the shipping rates? The Alliance will ship to the United States for a flat rate of $4. Shipping outside the United States is priced individually as rates vary based on country. Full payment and an email address are required for orders outside of the United States and Canada. Due to high levels of deceit in these situations, orders cannot ship without payment in advance. Why have I not received the free premium I requested from the Alliance? In order to share our limited resources with as many people as possible, please limit your free requests to no more than one per month per household. What are MP3s? And what is the difference between MP3s on CD and MP3s on DVD? MP3s are digital audio files that can be played on a variety of players. Due to the smaller file size, more MP3 messages can fit per disc than traditional audio files. MP3s on CD can be played in some CD players, most DVD players, and on the computer. MP3s on DVD can be played in most DVD players and newer computers. In all cases MP3s can be saved to a computer, imported into iTunes, Windows Media Player, or similar software and then sent to a portable MP3 player like an iPod. One other MP3 fact is that many publishers digitally protect MP3 files to stop copying and sharing. We do not restrict our MP3s. So you may make copies for your personal use across several players. But we do ask that one respect the Alliance's licenses and permissions with our contributors and speakers by not distributing beyond your own personal, family use. Why Isn't the Message I'm Looking for Available? The Alliance of Confessing Evangelicals has thousands of messages, hundreds of sets, in several different formats and media types. The possible combinations and outputs can be overwhelming. Occasionally messages are not recorded at a high quality or are lost. We have made all attempts within our limited resources to provide the best quality, complete content. But situations and occasions arise when certain messages are not usable or are not of the highest level. In those cases, we apologize. Should you receive any resource from the Alliance with which you are not 100% satisfied, we will happily replace it or refund your payment. Thank you for your partnership with the Alliance! Does the Alliance record and offer event Q&A sessions for sale? Event Question & Answer session recordings are not available due to the lower quality recording that is usually accomplished during these sessions. Further, they are often done in a light-hearted and joking manner and without the benefit of hearing it in its entirety or seeing the speakers in context, the message could be confusing or hurtful. 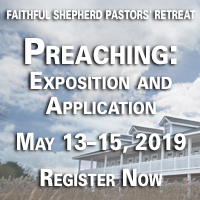 The Alliance encourages conference attendance to hear these sessions, as well as fellowship and teaching. My order has arrived damaged or incorrect, what should I do? First, the Alliance stands behind all of its products, attempting to ship right every time, first time. But mistakes and errors do happen in the manufacturing and distribution process, so we promise to make it right! If you find something broken or wrong, you should let us know right away. The fastest way is to phone our member services team at 215-546-3696, Monday through Friday between 9:00 a.m. and 4:00 p.m. Eastern. You can also email alliance@alliancenet.org . 1. If you received faulty or wrong audio or video manufactured by the Alliance, we will simply ship a completely new set (up to the full volume). If it's just one disc of the volume we encourage you to give away the remaining parts, once your new set arrives. 2. If you received a faulty or wrong book or product sold by others (and as we have to return those to our suppliers), we will a) send your new item right away and b) send a "call tag" so UPS can come and pick up the old item. The Alliance wants to deliver high quality resources correctly. We welcome the opportunity to serve you and look forward to making any errors or failures right. Can I burn copies of Alliance messages to share with others? The Alliance has a vast library of audio resources that we are pleased to share and pray you are blessed by it. We attempt to keep our costs low and as affordable as possible. It might go unnoticed that a single message required two plane flights, an honorarium to the speaker, hours of editing and mastering, as well as materials and packaging. Further, some content is available only by a license agreement with its owner. Every MP3 or CD purchased gives much needed funding to the ministry of the Alliance to continue it’s work in producing and delivering such high quality teaching, and ultimately resources. So we respectfully ask that our audio not be duplicated beyond personal use and never reposted on the internet. If you are an Alliance Friend, we will happily provide additional copies of your monthly CDs to share with others. If you are part of the Alliance President's Circle, we will gladly give you as much audio as you care to have and to give away. Alliance Allies get free audio as fast as they can return survey forms and can give away those messages as they wish. And Alliance Reformation Societies are encouraged to request audio sets to give away at their meetings. Can I get permission to reprint hymns from Hymns for a Modern Reformation? This content is available only by a license agreement with its owner Dr. Paul Jones. Please download and complete the HMR Permission Form linked here. How can I have Alliance content sent to me by email or RSS? The Alliance offers many streams of content and through many providers. We seek to provide not only excellent resources, but also in various forms based on the way our members can best use them. Below is a complete list of all of our streams and providers. Be sure to sign up today! Why do the blogs not accept comments? Alliance websites and blogs are directed and edited by ordained pastors and theologians, seeking to provide insights into the important doctrines and debates of our day. It was not designed to be a public square where all ideas share equal footing. However, your opinions are important to us! Visit our LinkedIn page to discuss new articles each week. Why don't I see the latest features of the website? If you visit our website frequently, your web browser stores elements of the web page in a cache so they do not have to be downloaded each visit, making browsing faster. In some cases, when a website is changed, you may not be able to view the changes because you are viewing the cache. To solve this problem, do a hard refresh, which bypasses the cache and loads the actual page as it is stored on the server. To do this hold down the command or control key while clicking on the refresh button or pressing F5. Alternatively, you can hold down the shift key, the command/control key, and the letter R.
All content included in the Alliance websites (including AllianceNet.org, Reformed Resources.org, and Reformation21.org) is protected by United States and international copyright laws. This includes but is not limited to any icons, images, software, downloads, data, audio, video, articles, weblogs, graphics, photographs, slogans, and trademarks. The compilation of the content on the Alliance sites is the exclusive property of the Alliance of Confessing Evangelicals. The Alliance of Confessing Evangelicals grants limited license to the Alliance sites for personal use. At no time will any portion of the Alliance sites be reproduced, transferred, duplicated, copied, sold, or exploited for any commercial use without the express written consent of the Alliance. Any unauthorized use of the Alliance sites will result in the termination of the license granted by the Alliance. Any electronic downloads, MP3, CD, or DVD produced, sold, or given away by the Alliance of Confessing Evangelicals may not be copied or reproduced without the expressed written permission of the Alliance. © 2019 Alliance of Confessing Evangelicals, Inc.